Composed by Paul SanGregory. 21st Century. Score, Sheet Music Single. 8 pages. Published by Distant Engraver Music (S0.367719). 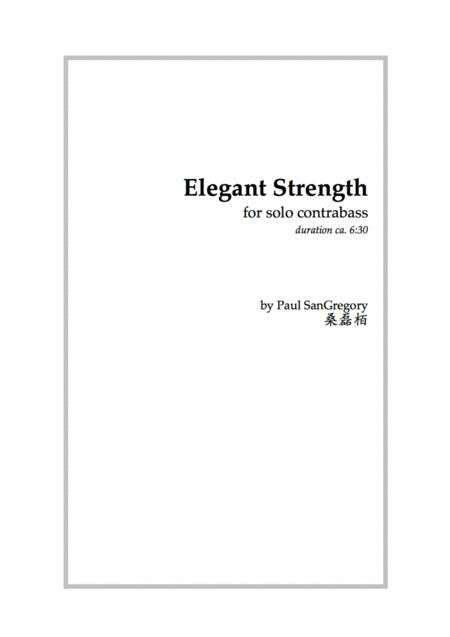 This is a unique and challenging solo piece for bass virtuosos that combines Chinese musical expression with various other bass techniques. As well as using pizzicato in aquasi guitar-like way to produce different contrapuntal voices, it utilizes the bass' melodic expressiveness (its elegance) and ability to produce heavyaggressive textures (its strength). The expressive techniques of Chinese guqin and erhu music also appear as special types of vibrato and pitch bends. Though it isn't really Chinese music, it does mimic the elegant phrasing andflexible expression of such Chinese music.